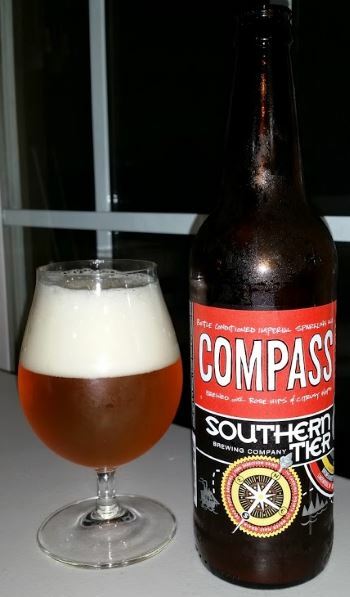 Compass, by New York’s Southern Tier Brewing Company, is an Imperial Sparkling American Pale Ale. Oh, and it’s bottle conditioned, and brewed with rose hips. So, it has a lot going on, to say the least. 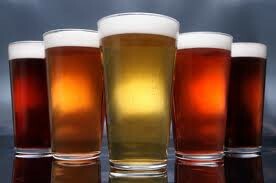 The nose is predominantly citrus with lemon and grapefruit, and it has a floral note that Southern Tier tells me is rose hips, but that I associate with honeysuckle, and a slight undertone of tropical fruit, specifically pineapple. The middle is creamy and buttery, with more tropical fruit and a bit of citrus. Southern Tier promises some bitterness, but I’m not tasting much at all. A tiny hint of citrus rind/pine in the finish, perhaps, which is also where the carbonation makes its presence felt. The body is medium, and the alcohol is a healthy imperial-level 9.0% ABV. I really like Southern Tier, but in honesty this one wasn’t one of my favorites. It’s good, but not great. This entry was posted in Reviews and tagged Ale, American Pale Ale, Imperial Pale Ale, New York, Pale Ale, Southern Tier, Sparkling Ale on December 23, 2014 by Xander.